Eric Gousios - Who Gets The Blame For Higher Rates? Are you mad? Whether you're a housing/mortgage professional or simply a person who might like to buy/sell/refinance a house at some point in the near future, you have a right to be frustrated. Housing is definitely in the midst of a cooling phase. There are many reasons for this, and they're not all bad or abnormal. It's hard to say which factors deserve the most blame, but everyone can agree that mortgage rates aren't helping. After all, they're as high as they've been since early 2011. But before we get mad at interest rates, we need to remember they're just responding to market forces and fiscal policies. We may want to blame rates, but rates want to place some blame as well. So who's going to get it? When it comes to blaming high rates on other factors, there are long-term and short-term considerations. This week, the most noticeable short-term factors were mid-term elections and the Federal Reserve's policy statement. With respect to elections, interest rates wanted Democrats to win a majority of the House. If the GOP had maintained control, it would have preserved the government's ability to spend money more easily (something that hurt rates a lot in 2018). For the few moments where pollsters predicted a GOP advantage, rates spiked before finally moving back down when Democrats re-took the lead. Later in the week, the Fed released its policy statement. No one expected the Fed to hike its policy rate this week, but investors often look for clues in Fed's verbiage. This week's Fed statement was almost identical to the last one. Financial markets were perhaps hoping the Fed would express some concern about October's market volatility. Such a move could have helped interest rates because it would have implied some moderation to the Fed's expected path of rate hikes in the future. 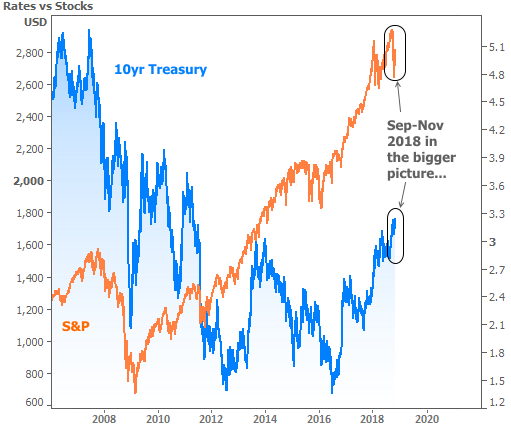 One of the reasons rates may have been able to hold their ground is the stock market's inability to break its mid-October ceiling. 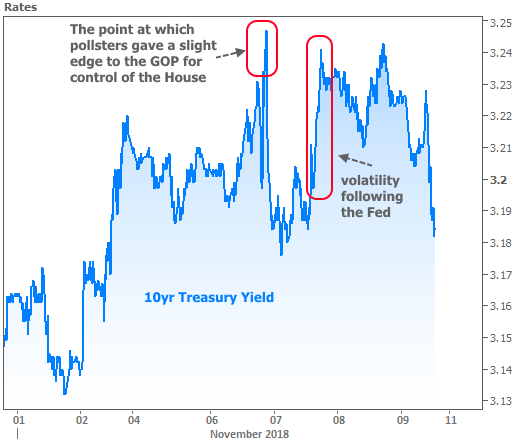 Rates and stocks definitely aren't required to move in lock step, but rates have certainly been willing to take cues from stock market volatility in the past 30 days. This is just something to keep an eye on in the event stocks continue lower next week. In the bigger picture, this week's interest rate reaction isn't even a blip on the radar. Rates would need to see A LOT more stock drama in order to reverse the upward trend that's been in place since mid-2016. If we really want to figure out where to place the blame for higher rates, we'll need to look well beyond the Fed. We've done this in the past by talking about fiscal policies like the tax bill or economic risks surrounding growth and inflation. We'll be revisiting those bigger picture themes in the future, but let's stick with the Fed for now. Even though their policies are mostly a response to financial conditions, it's nonetheless fashionable to blame them for creating those financial conditions. Is any of that deserved? As a matter of fact, SOME of it IS deserved when it comes to mortgage rates. Don't get me wrong. We wouldn't even have the mortgage market as we know it today without the Fed's intervention. On the friend/foe scale, they've been our biggest friend. But the time has come for them to be a bit less friendly, and that's been hurting mortgage rates more than it's been hurting rates in general. It's hard to explain why this is the case without going into mind-numbing detail, but here's the simple version. The Fed had been buying a lot of mortgage-backed debt (along with US Treasuries) in the past as a part of crisis response beginning in 2009. Buying debt helped push rates lower. Even when they weren't buying NEW debt, they were still taking the money they earned on that debt and reinvesting it back into the mortgage/Treasury market. Near the end of 2017, they said they'd be winding down those reinvestments. 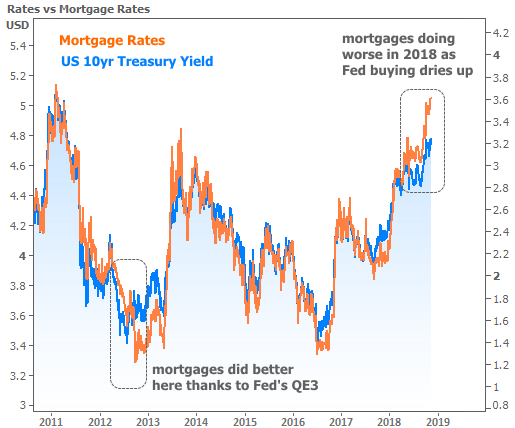 That winding-down process has affected mortgages more than Treasuries, and is one of the reasons mortgage rates have underperformed Treasuries in 2018. Mortgage rates still have to worry about the overall trajectory of the broader interest rate market though! To that end, the mortgage market, the Fed, and the average bond investor are all watching what happens next in inflation. We know wages are stronger than they have been, but traders are waiting for more confirmation that wages will push inflation higher. When we get back from the upcoming 3-day weekend (Veterans Day), we'll get a key inflation report on Wednesday (Consumer Price Index or "CPI"). 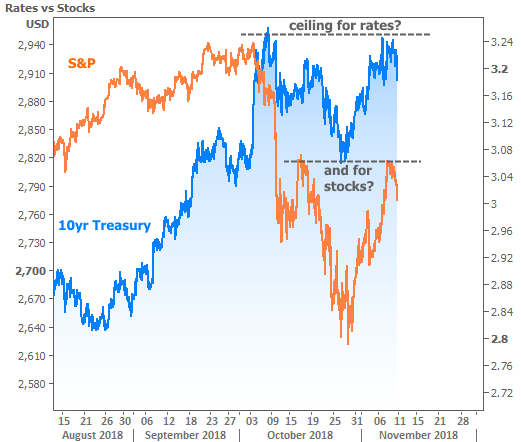 This could go a long way in determining whether rates are interested in maintaining their recent ceiling or breaking up to more long-term highs.